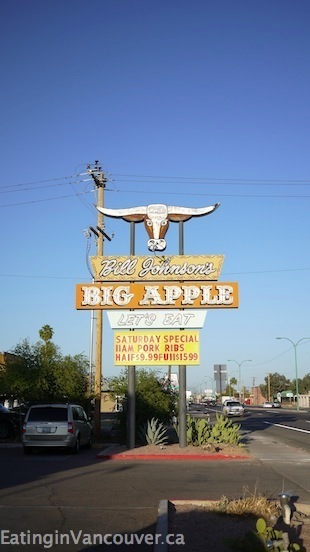 “Arizona Cookin’ Done Right”, Bill Johnson’s Big Apple boasts world-famous bbq, a great atmosphere, and incredible staff. With five locations serving every corner of Arizona’s Valley of the Sun, we decided to check out their Mesa restaurant to see if their claims stacked up. 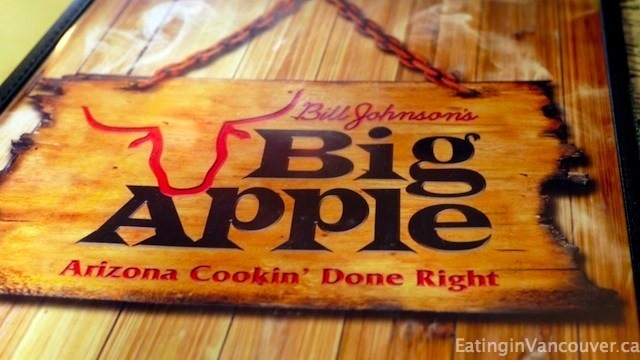 Situated on East Main Street, Bill Johnson’s Big Apple has a Western decor, including woodchips on the floor for a rustic ambiance. While perusing the menu, we noticed the restaurant serves it all, from award-winning country style breakfasts to barbeque and USDA choice steaks. The menu is quite extensive, including plenty of enticing sides to choose from. It was difficult to decide what to eat! We ordered a couple beverages to start: Bill’s Bottomless Drinks – one brewed ice tea and a lemonade, both served in massive cups. 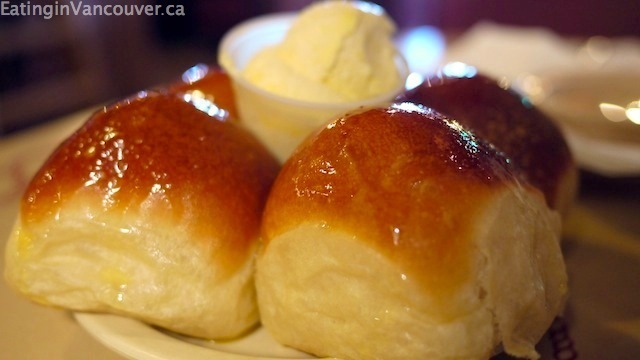 Warm buns glistening with melted butter and accompanied by even more butter on the side were served alongside our drinks. These were so good that we had to stop ourselves from eating them in order to save room for our main courses. 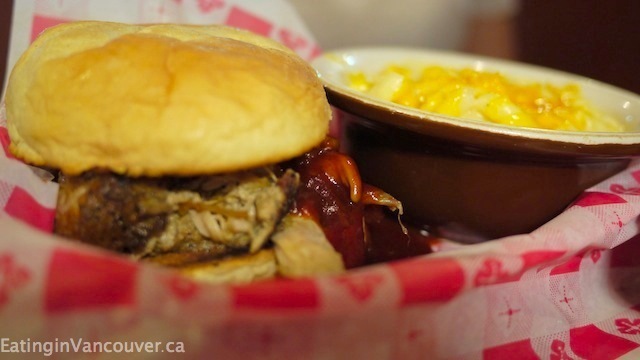 Pulled Pork Sandwich ($8.49) – Fall-off-the-bone tender pulled pork slathered in Bill’s BBQ sauce and served on a lightly toasted potato bun. For my side dish, I choose an ooey-gooey mac ‘n’ cheese to accompany this hearty sandwich. St. Louis Pork Ribs ($14.99) – Bill Johnson’s Big Apple is known for incredibly healthy portions of good ol’ down-home cooking, and this dish did not disappoint! 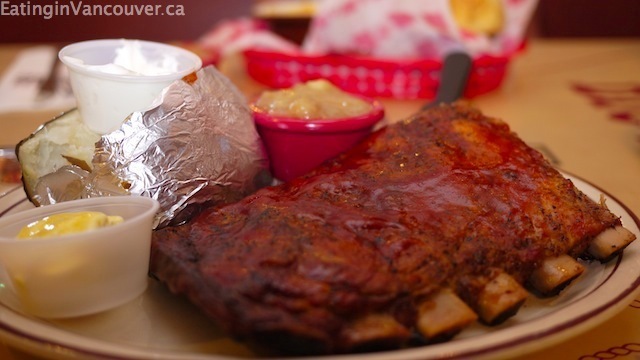 This rib recipe has been going strong for more than 55 years. Tender half rack of pork ribs served with a choice of two sides – we opted for a fluffy baked potato with sour cream and crispy yam fries. The meat literally fell off the bone it was so tender. Additionally, each dinner entree was served with their sweet homemade cinnamon apple sauce which paired nice with the pork. 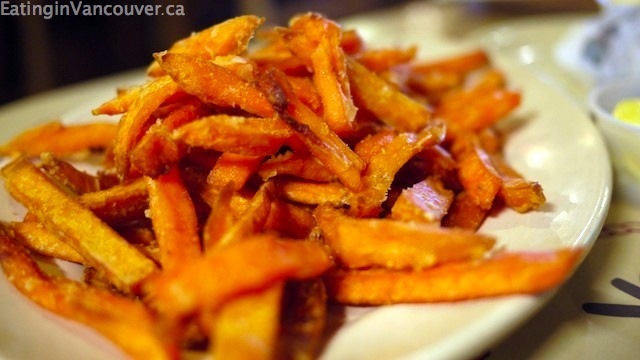 This “side” was really a platter-sized portion of delicious yam fries. We also ordered Beefy Cowboy Ribs ($15.99) to take home to my parents. They consisted of Bill’s premium beef ribs and also served with a choice of two sides and even more glistening buns were added to the take-out bag. 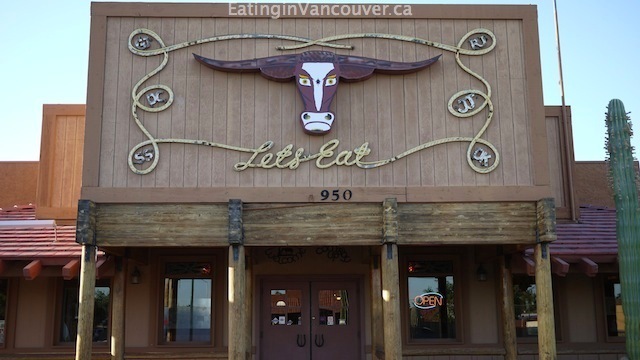 If you appreciate large portions of tasty bbq, then this is THE place for you! 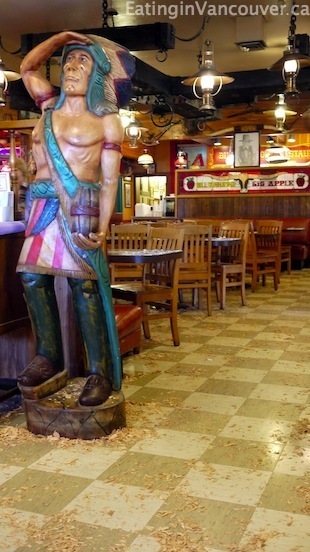 You’ll walk out with a full belly knowing you got the best bang for your buck, and the best service in town. Seriously. This was the most professional, helpful and attentive service we’ve experienced in years!